Almost half a million people have fled fighting in North Waziristan since military operations against Taliban began, and there will likely be more fleeing their homes for safety. 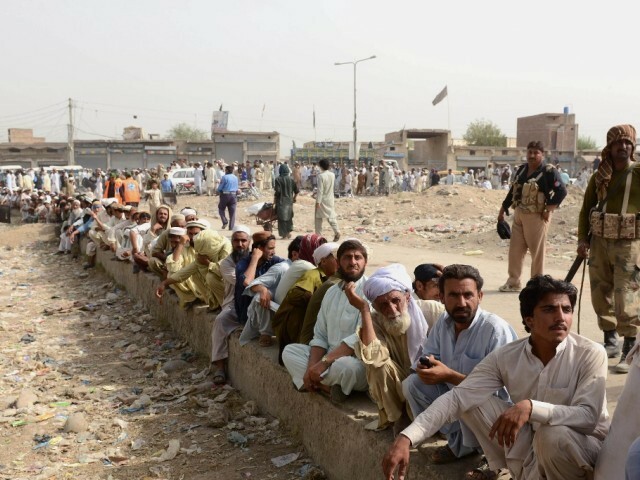 Such a large population of IDPs would present a challenge to any government, and proper care will require cooperation between government agencies and NGOs, and humanitarian aid provided by countries like UAE and USA. Unfortunately, there will also be some who try to take advantage of the crisis for their own personal gain. This is nothing new for Imran Khan. Since long he has argued that people should give to his charity and not the government because the government can’t be trusted. One problem, though – KAPTAAN’S PARTY CONTROLS KP GOVERNMENT. So why is Imran Khan asking for people to support his personal charity instead of government programs? Shouldn’t he be trying to improve confidence in government programs, not undermining them? It should be noted that JuD was originally established as part of a PR campaign to distract from Lashkar-e-Taiba’s militant activities. However Hafiz Saeed has a hard time keeping quiet about his true intentions and is often found publicly advocating jihad against one foreign country or another, which is why a third front group had to be established known as ‘Falah-e-Insaniat Foundation‘. There is no question that groups like Imran Khan Foundation and FIF provide charity work. But let us not be so naive as to believe that these groups work from a purely benevolent purpose. Unlike someone like Abdul Sattar Edhi, Imran Khan and Hafiz Saeed operate their charities for two main reasons: They provide a softer image for their political ambitions, and they provide important fundraising arms. The second point should not be understated. Again, while it is true that Imran Khan Foundation and FIF spend their funds on charity work, that spending provides jobs for party supporters and it buys the goodwill of the people that they are serving. If you are helping a man feed his children, he is more likely to overlook what ‘other’ activities you are doing. Meanwhile, the other funds that are collected can be put towards the ‘less charitable’ activities of each group, whether it is PTI’s gaining political power or providing material support for one of JuD’s many jihads. In the end, the IDPs are treated by these groups as mere pawns and are appreciated only as long as they are useful to their political ambitions. They deserve better. When thinking where to give charity especially during this holy month of Ramzan, make sure you are not being used as a pawn also. This entry was posted in Blogs and tagged Edhi, Falah-e-Insaniat Foundation, IDPs, Imran Khan Foundation, Jamaat-ud-Dawa by Sidra Jafri. Bookmark the permalink. Very biased piece of writing by the author.I wonder she deos not know anything about the role of non governmental organizations and philanthropic personalities during a man-made or natural disaster.